Super Shooters Complete Texture Service and Redline Environmental join forces to bring you a one stop shop for asbestos acoustic ceiling abatement and refinishing saving our customers time and money!!! Now just one call does it all. In the past to have your asbestos acoustic ceiling removed and refinished it required an asbestos abatement contractor, a drywall finishing contractor and a painting contractor and as an option a certified asbestos consultant to provide third party independent air clearance. This meant scheduling estimate appointments, hiring of these contractors and scheduling the work so one can follow the other. If one person doesn’t perform on time your project schedule falls like dominos! What a hassle. First be sure your ceiling is asbestos. If your home was built before 1981 your ceiling may or may not contain asbestos. Keith Martin Owner of Super Shooters Complete texture Service is a Certified Asbestos building inspector in compliance Toxic Substance Control Act Title 11. He will take samples of your ceiling and deliver them to a Laboratory for Analysis at no charge. All you will be responsible for is the Laboratory fees which are currently $40.00 per sample. 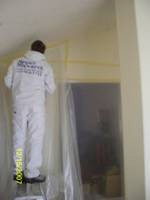 Your home is prepared for abatement of your asbestos containing acoustic ceiling by covering the floors, walls, windows and exterior doors with one layer of plastic, Once the area is completely protected we cover the floors with two additional layers of plastic and the walls with one additional layer of plastic, a three stage decontamination unit is then installed at entrance to work area and a negative air machine is installed at other end of work site to create negative air pressure in the work area during the abatement process, Fixtures are then removed from ceiling. Certified asbestos supervisors & workers from Red line Environmental csl#809926 D.O.S.H.#825 then put on hazardous material suits and respirators and begin the abatement process this is done by getting the ceiling wet and scraping it off the drywall with a taping knife, once the acoustic is removed one layer of plastic is removed from the walls and two from the floors this material is then placed in double layered hazmat bags to be picked up and disposed of by a hazardous waste disposal company. You will receive a copy of the hazardous waste manifest. At this point, the abatement process is complete leaving a protective layer of plastic on the walls and floors for ceiling refinishing. At this point, optional third party air clearances are performed by National Analytical Labs. 916-361-0555 www.nal1.com. All members of the abatement team have been trained by an O.S.H.A and E.P.A approved facility at the contactor-supervisor level and has an average of over fifteen years in the acoustic ceiling removal and drywall refinishing industry. All drywall is inspected for integrity and tightness to wood framing. Any bad joint tape is replaced; all joints and nails are coated with joint compound to achieve as smooth a surface as possible. New wall texture is then applied. As an option, two coats of stain blocking primer and flat paint are then applied to provide you a finished ceiling. The final layers of protective plastic are then removed and work area cleaned. If you choose we will then replace fixtures to the ceiling. Please be aware that our masking tape will pull paint from the top of your walls and that the new texture follows the same edge as your existing ceiling Please be aware that during the refinishing portion of you project We must wash our ladders and tools off outside leaving some residue that is water-soluble, dissipates fairly rapidly and won’t harm any plant or animals. This is asbestos free material. Your entire project completed start to finish conveniently with one phone call, one contact person, one date to schedule. What we need you to do. In simplest terms, we need the work area clear, vacant. All cloth window coverings must be removed. Closets if not being abated can remain full. When we arrive please give our crew leader a key or some other access to the property and a way to contact you at the end of the abatement process. If you have any questions or need further instructions please call us at 916-944-1711.